Jojutlas | North Canton, Ohio UPDATE: CLOSE | dreaming of the next bite. There is a new Mexican restaurant in town that’s totally different than all the rest, and not just because nobody knows how to pronounce its name. Jojutlas (Ho-HOOT-las, located on Portage Street, near the intersection of Frank Road) just opened, and is bringing a little authentic Mexican food to northeast Ohio. (Don’t worry, I’m not knocking our friends at El Rincon – this is just a completely different style.) 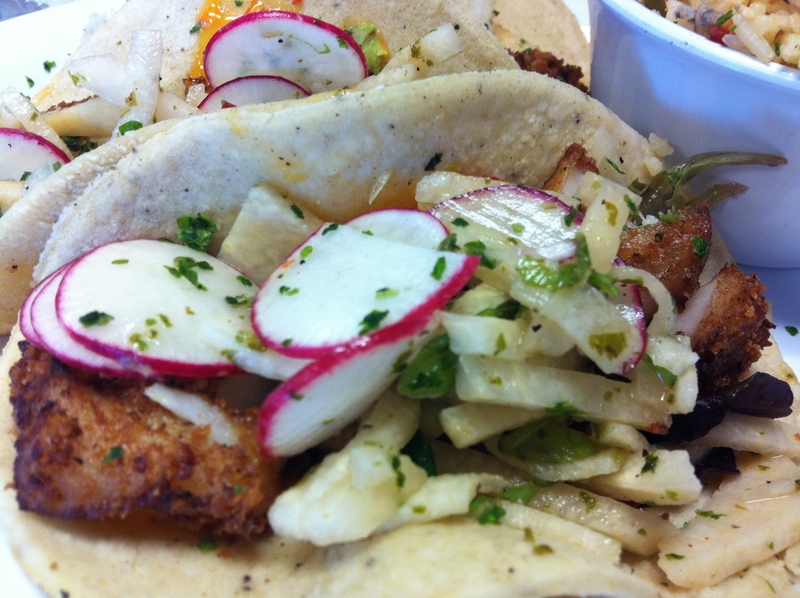 Finally, a delicious fish taco has arrived in Canton. And served on a homemade tortilla, no less! 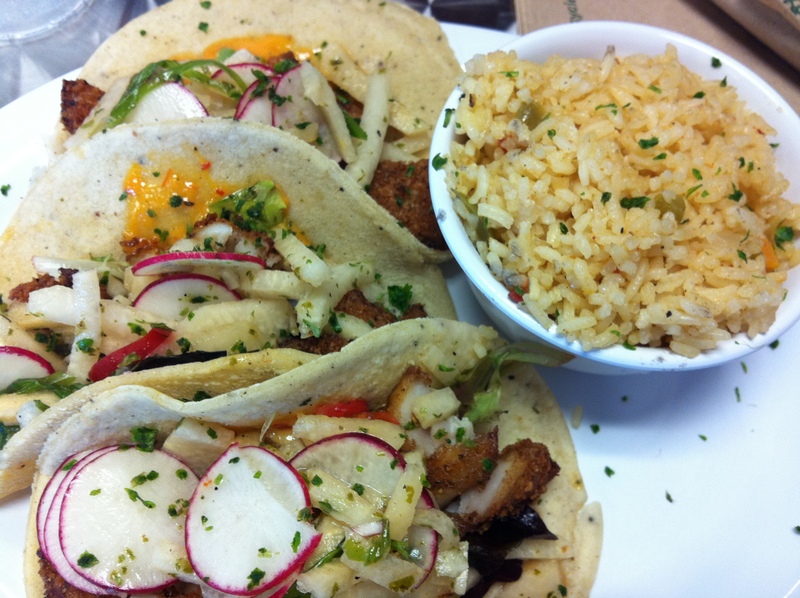 Here, whitefish is lightly breaded (“Azteca style”), fried, and paired with a lovely jicama radish slaw, then served on a homemade white corn tortilla. (Homemade tortilla, can you believe it?) 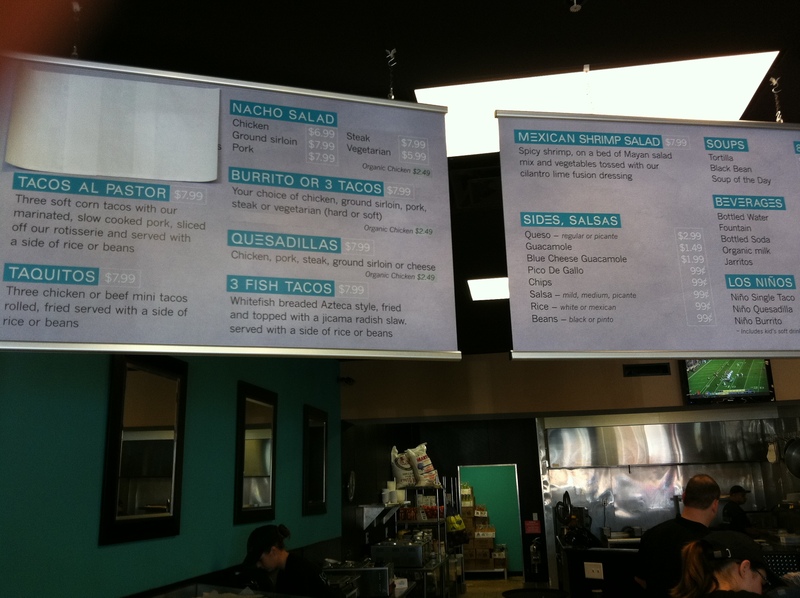 The three tacos were served with choice of rice, pinto, or black beans. The tacos were very light, but also pretty filling – I could only eat two. The subtle citrus in the slaw was just the right balance to the fish, and a drizzle of sauce added a tasty little punch. Did I mention the homemade tortillas are a-MA-zing? What a difference the tortilla can make. You won’t find any of that at Jojutlas. Short menu, fresh (a.k.a. raw) ingredients. Other available items include pork tacos, taquitos (can’t wait to try these), burritos, a shrimp salad, quesadillas, and soup. 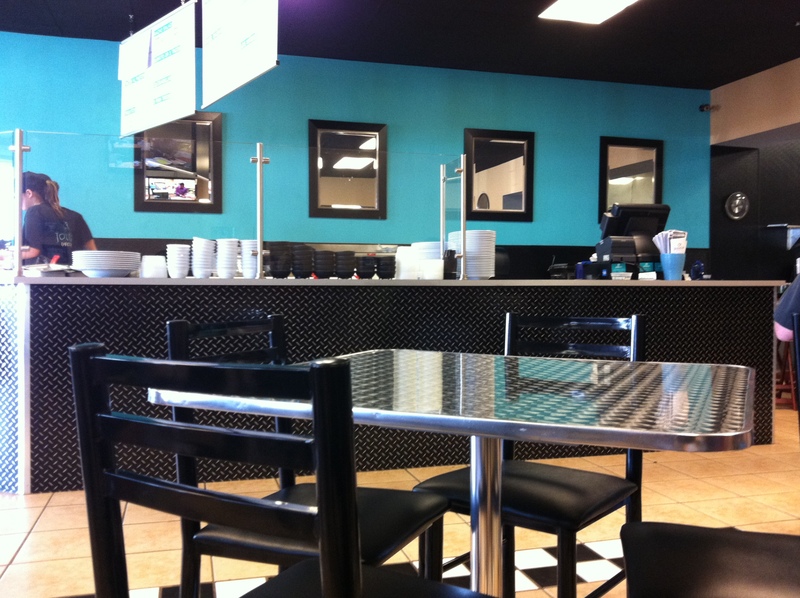 The dining room is very casual with a semi self-serve format, wherein you order at the counter and pay at the register, then a short while later, someone brings the food out to your table. The place was busy when I went, (Thursday at lunch time) which is good to see. Of course, being the first month, there are always some bugs to work out, but they seemed to have it together pretty well. Service was extra friendly and helpful. So, great place, LOVING the fish tacos, definitely a Canton original. (Even you hard-core El Rincon fans need to go check it out.) Thank you Jojutlas for bringing me a little piece of San Diego Mexican food! This entry was posted in Canton, OH and tagged fish taco, Mexican, one-and-only by Yvette (@foodiedreamer). Bookmark the permalink. By the way, have you tried Mi Casa in Hartville? They do a pretty good job with Latin American food that isn’t just the typical fajitas, burritos, refried beans and rice that places like el campesino churns out. Of course they have those things, but so much more Their guacamole is actually made with fresh avocados and cilantro. They make a nice cuban sandwich (not perfectly authentic, but hits the right notes with the panini style bread, ham and roasted pork) They offer a chicken mole that doesn’t have a sauce out of a package. They use queso fresco on their tacos. Much better ingredients than you would expect in Hartville. People notice when you put effort into food, and that’s why it’s almost always busy. Wow, yeah who knew Hartville would be crankin’ out some quality Mexican food?! I’ll def try Mi Casa! Thanks for the tip! 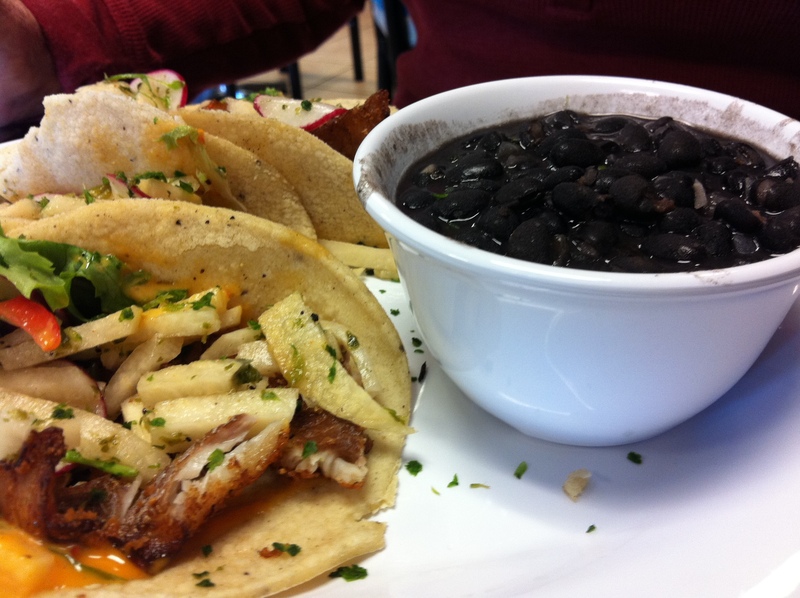 Mi Casa and Jojutlas – my two favorite places for Mexican. Head north to Paladar in Cleveland for your Cuban fix andyou’ve got Latin cuisine in NEO locked up!! Wow went to Jojutlas for the very first time today, and man was I impressed!!! The food was absolutley outstanding! By far the best Mexican Food I think that I have ever had, highly recommend it! They are even B.Y.O.B (Bring your own bottle) Anything!! Forsure a MUST GO! Props to Mi Casa. We live in Alliance, and it’s definately worth the drive. Actually, it has become “our” restaurant. Good prices, very friendly staff. A little small though, so plan ahead. I’m so glad I stumbled across your blog tonight! I’m new to the area and am so sick of the boring chain food that this town seems to have in abundance. 🙂 I have to ask, what do you order at El Rincon? I’ve struck out several times…most memorably the tomales and the chicken enchiladas. What am I missing?